They’re not going to wade through streams of blah-blah-blah. If they don’t find what they are looking for quickly and easily they’ll leave and move on to the next website. They’re not lazy. When people browse the web they are looking for quick answers and they don’t want to read the whole page to find it. 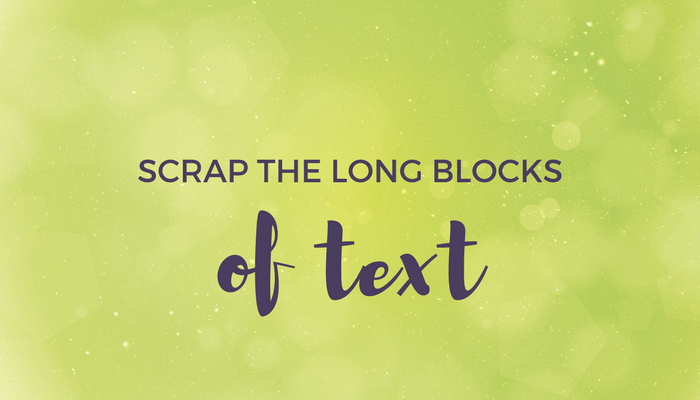 That means you have got to scrap the long blocks of text. They’re scary, and people will skip them because it’s too much work. You’re probably scanning this article right now, which is why I wrote it with short paragraphs to help you out. Remember, on mobile devices especially, short paragraphs are important in helping users read quickly.